The key to doing effective, proper, and relevant competitive research is to look at who you are actually competing against. 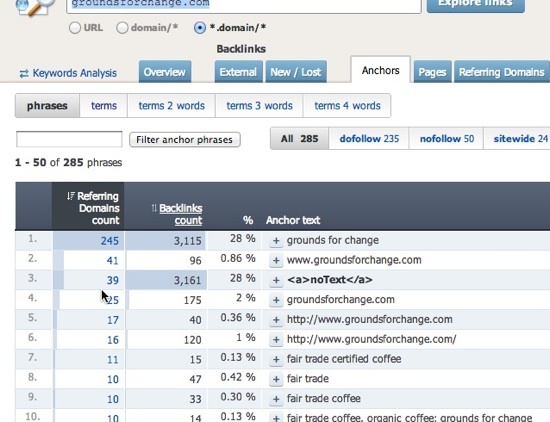 There are a variety of ways to accomplish this and depending on your market and your goals it might make sense to introduce different tools for different purposes, but when evaluating competition in the SERPs for organic SEO I like to start with two of my favorite tools; Ahrefs.Com and SemRush.Com. Tools cannot replace experience, foresight into where search or this particular SERP might be heading (think Travel, Credit Cards, Shopping, etc), and gut feelings but this process will give you a clear picture into who you are competing against and the hurdles you are likely to face. So let’s say I’m competing in the organic coffee space. Maybe I want to start an actual coffee company, or build a resource site, or do something with private labeling, drop-shipping, or affiliate products. I usually grab the top 5 non-wikipedia sites for the core term and begin narrowing down my research there. Some SERPs will have shopping inserts and a local result or four (in this niche anyhow) but generally the top 5 domains will give you an idea of who is doing a better job overall, who is trending up or down, and who you really need to go after to win in this particular market. 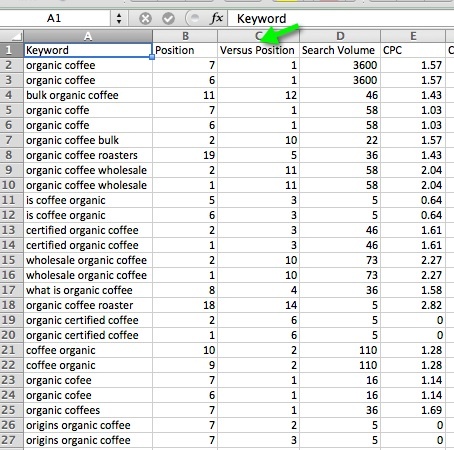 You could really spend all day pulling reports for each site, combining and deduplicating spreadsheets, building your own charts, and so on but I think to look at top competing sites at a high level and allocate research time to the stronger sites I need to beat in order to make the organic SEO piece of my marketing a successful one. When a few drops in positioning means going from double-digit percentages of clicks on the query to single digits it really drives home the point that you really need to rank in the top 2 or 3 for your core terms in order to fully realize a worthwhile ROI. While the SERPs are not an exact science, if you can identify the best performing site (or two) and design your strategy on beating them, your chances are exponentially better at success for a particular term. 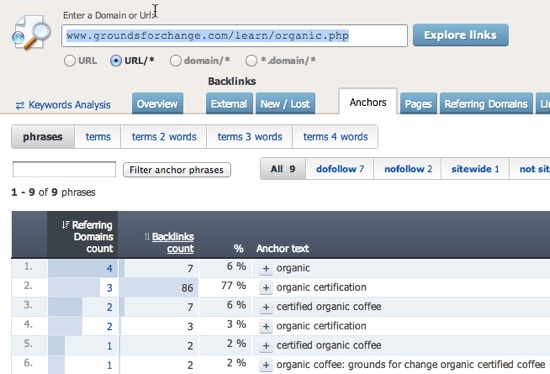 SemRush has a variety of tools that you can come back to for individual domain and keyword research but for now we are going to focus on comparing these domains to see who is the stronger organic SEO play. On comparison you can see that while the bottom few domains are trending up over the last year there are clearly 2 sites owning most of the space with respect to the overall number of keywords found ranking in Google. 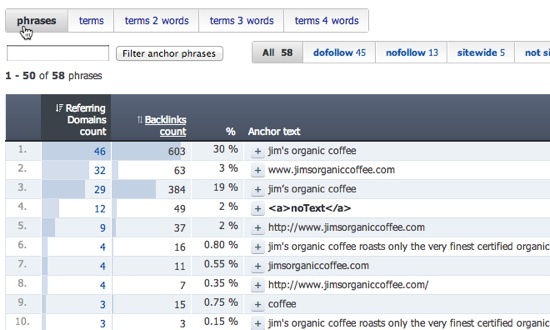 You can see where jimsorganiccoffee.com took about a 10 percent rip from deansbeans.com when compared to total keywords ranked for. 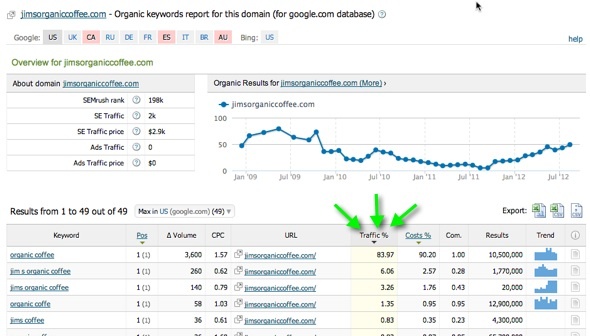 This could be interesting because it could mean that Jim’s is ranking higher for keywords with more volume or it could mean that perhaps Jim’s benefits from more branded queries. This is something I would make a note of for future research. We also have to keep in mind that some of these sites might sell additional stuff that we will not be selling; this will become clearer during additional research. From here we can see that we should probably be concentrating our research on three of these domains. We still need to figure out where the spike in traffic and value is coming from off of jimsorganiccoffee.com but for now I would be comfortable limiting most of my research to these three sites. 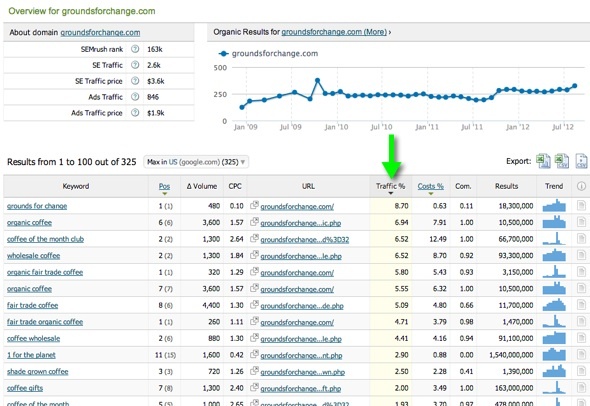 The other tool in SemRush you can use to compare domains is the Domain vs Domain feature. 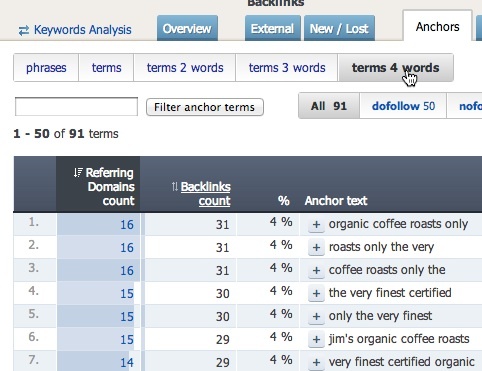 Here, you can enter up to 5 domains and get common keywords that they all rank somewhere for. 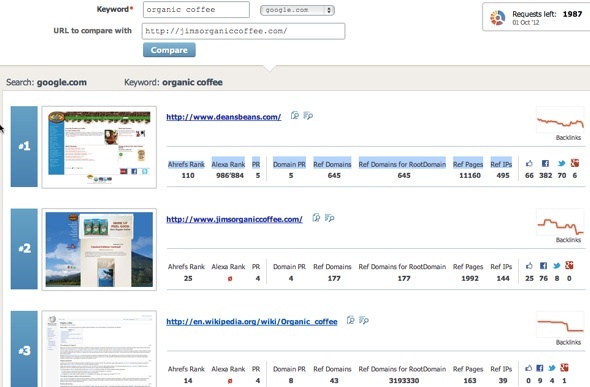 This is a good way to find organic keyword overlap but what’s really cool is if you click the asterik (in the image above) you can compare 2 domains and where each ranks for common keywords. 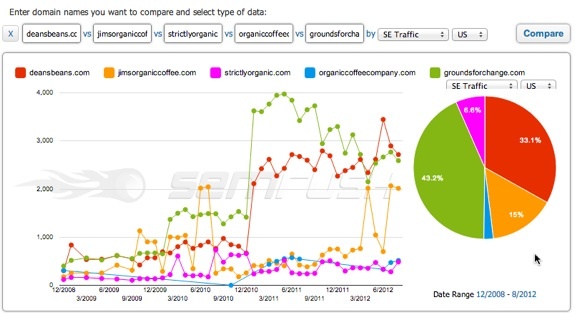 So far, it appears that ranking number 1 for that core term “organic coffee” is a driving force behind those increases in traffic and traffic price from earlier comparisons. Clearly, we can see that Jim’s gets almost 90% of its estimated traffic from that core term and the next highest ones are branded. We will certainly keep this site for further analysis to try and see how that ranking was achieved but we also need to keep the other 2 as they rank for a much wider array of terms that probably matter to our site. The usability of this tool, the depth, the freshness, and the additional features really make it my first choice for quick and relevant link analysis. Ahrefs does a lot more than just pure link analysis. 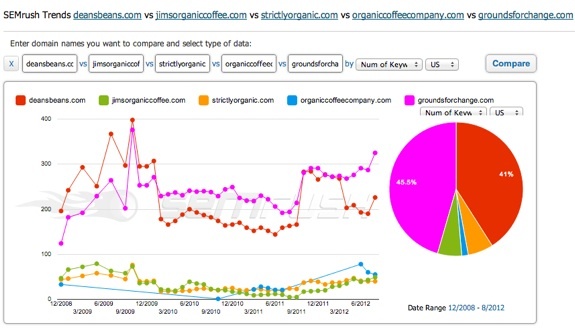 They have incorporated SemRush-like features into their competitive analysis as well as social data for given domains. 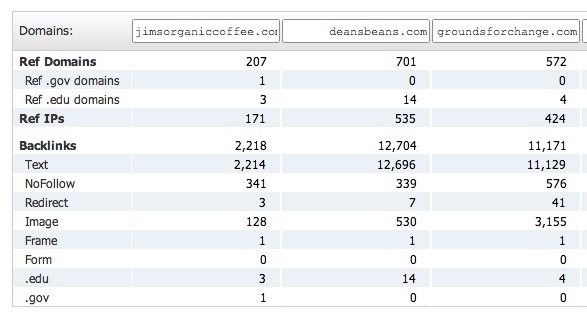 In various ranking checks, DeansBeans.com and JimsOrganicCoffee.com flip flop between #1 and #2 and you can see where DeansBeans.com is way ahead of the pack in terms of raw metric counts (not so much in PR or various 3rd party authority formulas like referring IP’s, social data, root domains linking, and so on. You can also go with the batch comparison tool in Ahrefs and see data for the specific entered URL (if a page is ranking instead of a domain for example) similar to the metrics mentioned above but also including a breakdown of linking edu’s, .gov’s, no-follow links, etc. 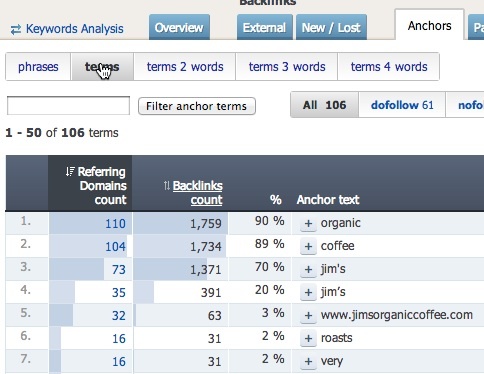 Jim’s is likely to be benefiting from having the keyword in their domain (a partial exact match) as well as probably having lots of natural branded links which also contain the target phrase. Now, Ahrefs is a full-featured tool that is also very useful for ongoing research and for tracking linking patterns of competitors over time as well as tracking the effects of your own link building efforts. In this example, we are doing the initial competitive research on the potential competition so we need not use every tool they have. I do encourage you to test them out though, it really is an excellent set of tools. 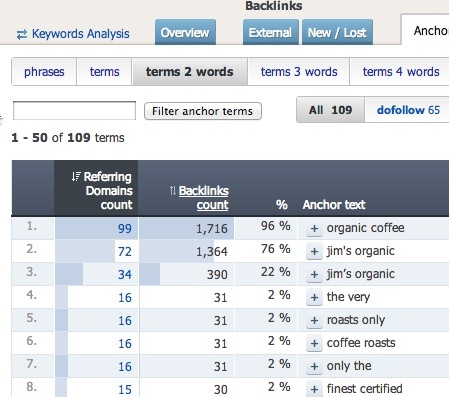 Now that we’ve been able to see the lay of the land, it’s time to look at the individual backlink profiles of each competitor to check out quality and quantity of links and their corresponding anchor text break downs. For these checks I like to go into their Site Explorer and check out a fresh view of the link profile. You can click the + button to see the linking domains for the phrase and they are pretty solid (or at least “real” links) on top of being a very natural looking link profile. You can break down the profile further, into singular terms, 2, 3, and 4 term phrases in regards to the anchor text breakdown. This really helps get a good, high-level view of the anchor profile across the board. As you can see with Jim’s, it all appears to be very natural and the site is certainly benefiting from the partial exact match domain (in terms of link anchors, as there is no bonus for partial exact match domains on their own). Breaking it down further, below you can see the anchor profile for DeansBeans.com and GroundsForChange.com. 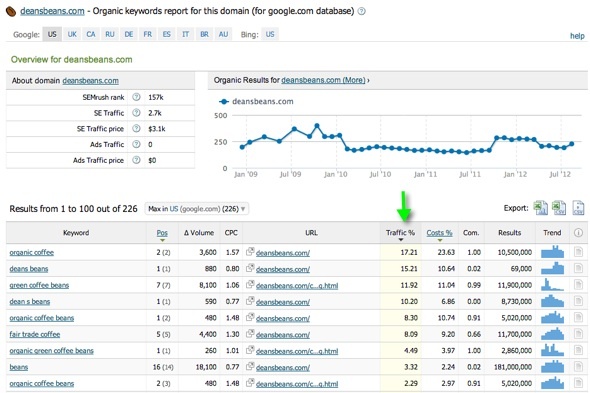 DeansBeans.com is certainly heavily weighted towards their brand name but since their brand doesn’t have the core keyword in it, while a competitor’s does, they are losing out on anchor text relevancy but their brand strength and shear link count/quality are making up for it. 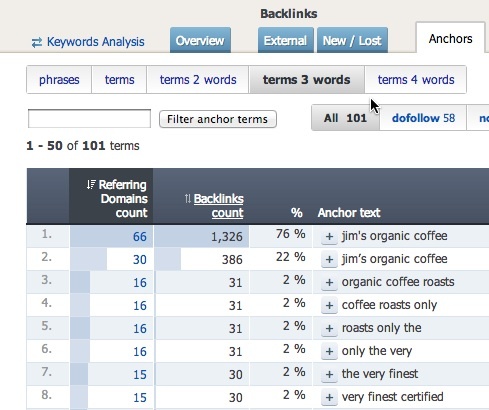 Both tools here have keyword research and link components (SemRush’s is in beta but available) but I think to maximize the use of SEO tools by using the tool’s core strength(s). If cash flow is tight you can always rock one tool for this kind of initial analysis but using the tools properly should eventually pay off financially for you via your online marketing efforts. You can dive deeper into each domain over time, as you compete with them for your chosen keywords, or during this research you might decide to go a bit more lateral and add more domains to the mix. 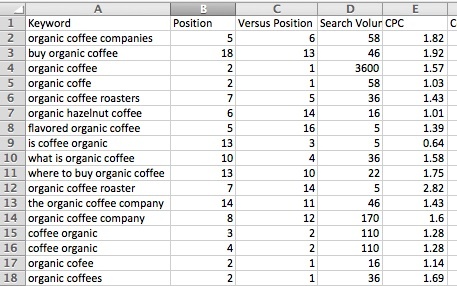 This is the general format I like to follow when conducting some initial, keyword-level competitive research. It typically gives me a rough idea (nothing is ever exact) of what I’m up against and how they got there, in addition to holes in their campaign where I might be able to pick up some additional wins. Very nice read – thanks. 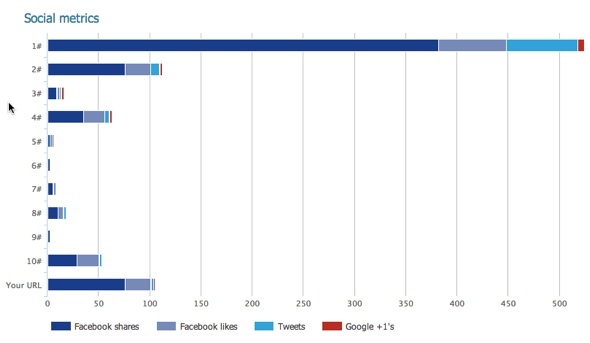 Thanks to author of this content because it is one of the best content for seo competition research. It is in detail and most valuable for intermediate level seo. Again thanks to author for sharing your knowledge. SEMRush is great but very expensive. Please post more about free SEO tools. Is there a way to receive posts to this blog via email subscription?